JEFFERSON - Last week, the Northeast Counties Farm Bureau office opened its new office in Jefferson, after relocating from Orwell. The office covers the farm bureaus for Ashtabula, Geauga, Lake and Trumbull counties. “We’re really excited to be here,” Ohio Farm Bureau Federation Organization Director Mandy Orahood said. The new location is at 28 W. Jefferson St., Jefferson, OH, 44047, between Huntington and First Commonwealth banks, with parking located behind the building. The office is open Monday through Friday from 8 a.m. 4:30 p.m. The Farm Bureau office phone number will remain the same (440426-2195). An open house will be held at a later date. Watch for details. Farm Bureau is a grassroots organization working together with farmers to advance agriculture and strengthen communities. The new location offers more space for the Farm Bureau, and already Orahood has seen an increase in foot traffic. Naturally, the move will benefit Ashtabula County more than it will Geauga, Lake and Trumbull counties. visible. It’s also great to be close to OSU-Extension, SWCD, the county auditor, and our elected officials,” Orahood said. People may stop in to get information on the Farm Bureau, upcoming events and programs and more. Members can pick up their complimentary $2,500 reward signs. Also available for purchase to Farm Bureau members are Agritourism, Ag District, Equine Liability Act, No Trespassing, and Private Property signs that meet legal requirements pertaining to each issue. • Share their ag story, membership testimony, etc. “We are also here to direct our members and residents of the community on where to find help and the info they need,” Orahood said. —Legal series brochures and landowner toolkit (for members) that summarize laws and regulations from CAUV to open burning, dog laws, eminent domain, line fence and more. • Equipping landowners with information and resources to protect their quality of life. • Providing a network for young farmers and agriculture professionals to share ideas and learn about new opportunities. • Strengthening relationships across Ohio’s food system which supports 1 in 8 Ohio jobs. • Bringing our communities together to support the contributions of local agriculture. Last week, the Northeast Counties Farm Bureau office opened its new office in Jefferson. The new location is at 28 W. Jefferson St., Jefferson, OH, 44047, between Huntington and First Commonwealth banks, with parking located behind the building. 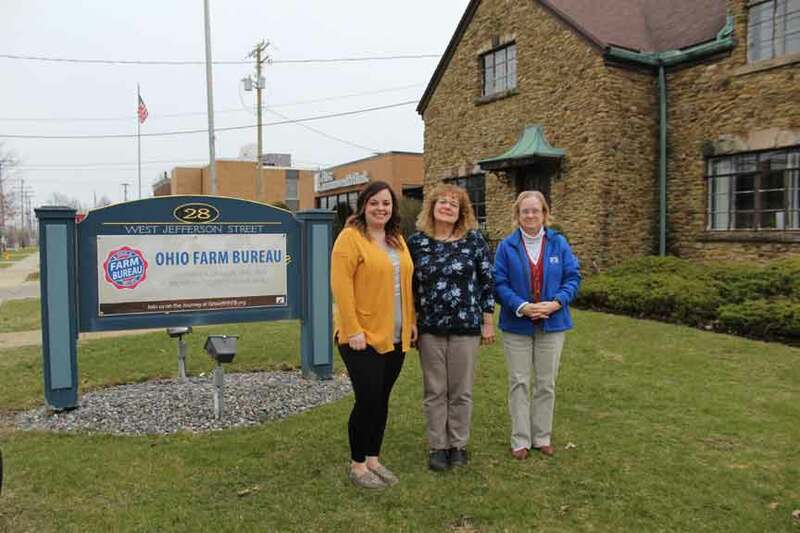 Pictured are Ohio Farm Bureau Federation Organization Director Mandy Orahood and county office administrators Marie Morris and Sue Spaller.